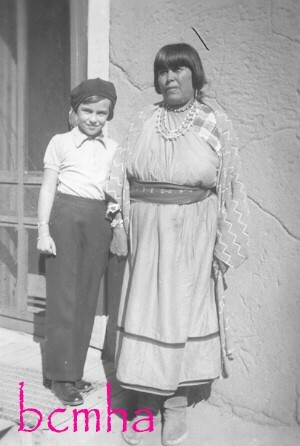 Maria Martinez was born in May 1887 to Tomas Montoya and Reyes Pena at the San Ildefonso Pueblo. When she was a young girl she would watch Florentino Montoya and his wife Martina Vigil make pottery. 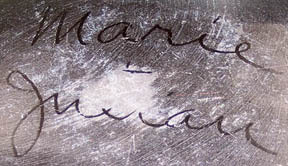 Florentino and Martina were both wonderful artists who made fabulous pottery mainly before the turn of the 20th century. Maria always talked about being a business person when she was young and her future would be bright with making pottery and selling it to tourists. 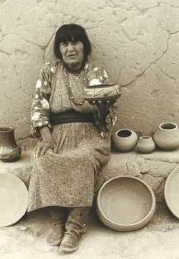 In the early 1900s the watching was over as she learned how to make pottery with her aunt Nicolasa Pena. 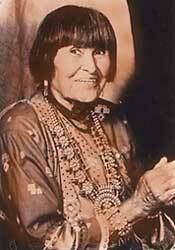 Sadly her aunt died in 1904 but Maria was well on her way to being a pottery monarch at the San Ildefonso Pueblo. One of the big opportunities Maria and Julian received was in the spring of 1904 they were invited to the St. Louis world’s fair. 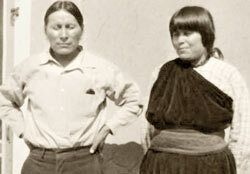 On April 11 they married at the pueblo and that same day left for St. Louis. The exposure that they both got the St. Louis world’s fair and then eleven years later at the 1915 San Diego world’s fair was a huge benefit for their popularity. I was told that Susanna Aguilar and Ignacio Aguilar were going to go but one of them was sick so they were replaced by Maria and Julian. 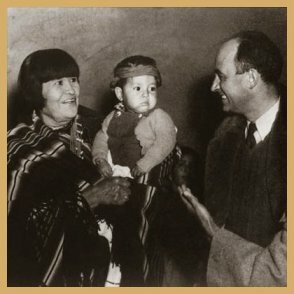 Around 1907 many of the San Ildefonso Pueblo men were working in the summer helping with the archaeological excavation run by Edgar Lee Hewett in the Bandolier Mountains which was an historical site for the people of the pueblo. 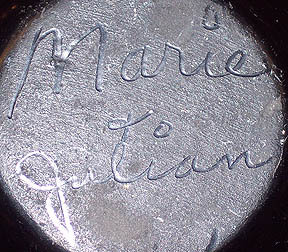 The second year of the dig Maria went along with her husband Julian Martinez. When she was there she found examples of pottery in chart form and also old polishing rocks. Embarrassingly she admitted to the foreman of the project that she took the rock and pottery charts. 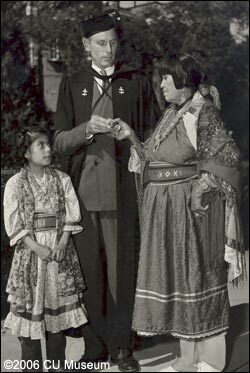 But he said it was okay and let her take him back to the pueblo. As she examined these charts she noticed that the sand they used was much more refined than the sand San Ildefonso Pueblo used for making pottery. So she and Julian set out to find a sand that was much finer than what they’ve been using. They went to the usual places but look a lot harder and were able to find this quality of sand. When she tested the new materials she made five pots. Two of the pots accidentally turned black as some of the smoke in the fire did not escape quickly enough. Julian and Maria were disappointed because you couldn’t see the designs on the pottery and they were pretty much a loss. So they put them on a shelf and didn’t think about it much after that. When the storekeeper came to get pottery to sell in Santa Fe they gave him the three new pots to see how they would sell and a bunch of the old-style pots. When the storekeeper returned he said all the pots sold very well and he needed many more pots. They had not made a lot of pots since the last time so they gave them everything they had and then Julian thought of an interesting idea. He went and got those two mistake pots the two black pots and brought them out to the storekeeper. Instead of telling them they were mistakes, Julian told him they were special pots that were colored black. So the storekeeper took them also and off he went back to Santa Fe. Not long after, the storekeeper returned and said I really need a bunch more those black pots, I didn’t even get them out onto the shelf before I sold both of them. So I need as many black pots as I can get. So Maria and Julian were a bit perplexed - their mistake have now become a very popular design. But it was a mistake and they don’t really know how to reproduce it. History on this gets a little hazy but most likely what happened was they took a trip across the river and went to Santa Clara Pueblo and asked them how to fire pots black, since they been making black pottery for quite some time. So they were able to start reproducing the black pottery which became a huge hit for several years. 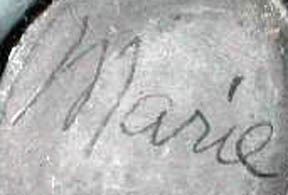 In the early 1910s Maria was working with two other people closely by helping her at her house. Those two other people were Tonita Roybal and Isabel Pena. So basically these three women started this new style revolution of pottery at the San Ildefonso Pueblo. Shortly after they got going Tonita and Isabel wanted to start making pottery at their own houses. They worked up their nerve and sheepishly came to Maria and asked her if they can go on their own. 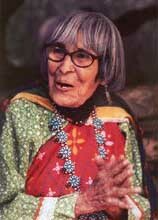 She of course said absolutely - pottery is from the pueblo not just from me. We are all part of this history of our people. 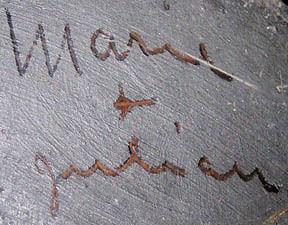 Around 1918 and 1919 the business was flourishing as Maria made the pots and Julian painted them. 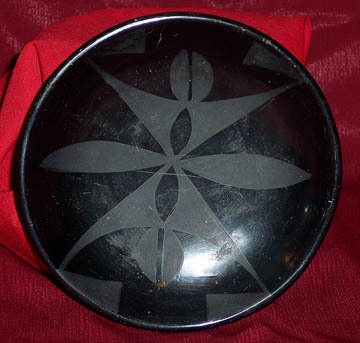 At the time the black pottery had no designs but black on red on and other kinds of polychrome had designs. One day during this time Julian got a little carried away and painted a design on one of the soon to be black pieces of pottery by accident. Maria was a bit annoyed. She assumed that the design would not be seen after the firing and figured it may be a wasted piece of pottery. To their surprise after he was fired the painted area came out more of a gray or a light black color. So there was a contrast between the painted area and the raw black area of the pot. 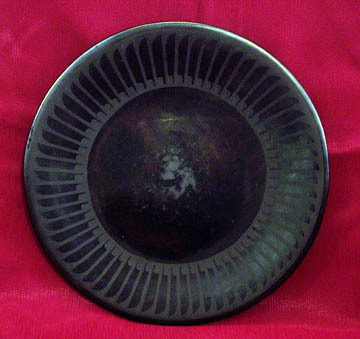 Black on black pottery was born. 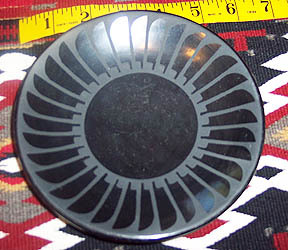 Again a mistake created a whole new industry in the pueblo pottery business. 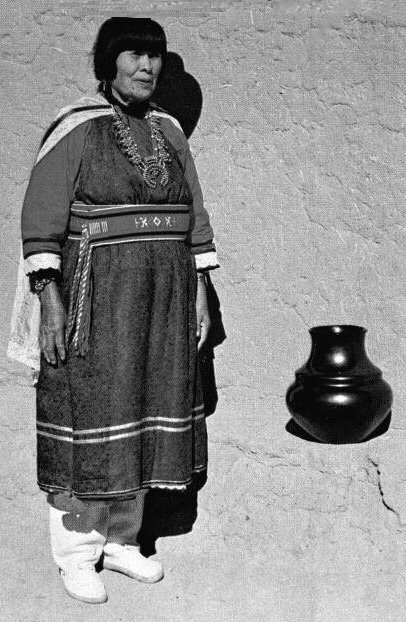 In the summer of 1919 Maria took her black on black pottery to the Santa Fe fair. This is the earliest documentation that we can find that describes this new pottery style. 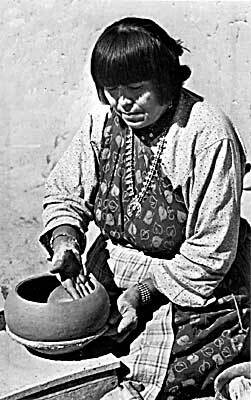 By the 1930s all but about four of the women at the pueblo made pottery or helped other people make their pottery. 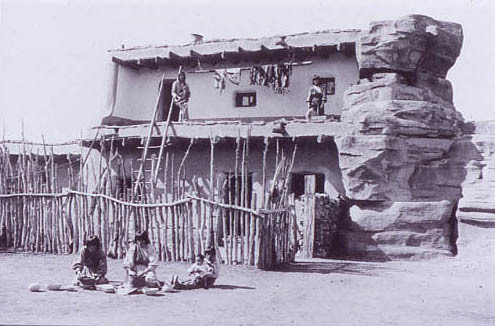 It was a great economic boom for the San Ildefonso Pueblo and many other pueblos in New Mexico. The trains which started around 1880 brought the people, the tourists in, an economy was born. 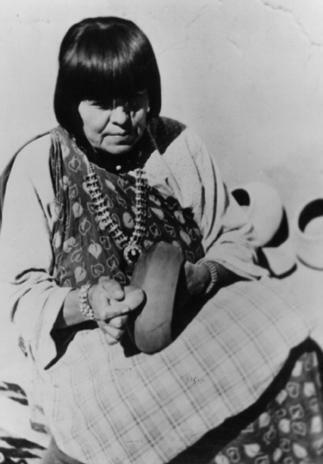 Maria had a very long life and a long career that shaped not only the San Ildefonso Pueblo economy but many pueblos and Indians in New Mexico. Unfortunately Julian Montoya passed away in March 1943 of exposure. He fought alcoholism most of his life. Maria Antonia Martinez and Julian Montoya had a total of 10 children, four of whom lived to adulthood. 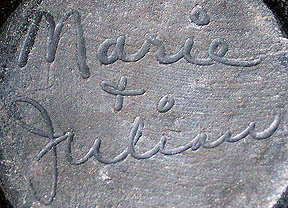 Maria passed away on July 20, 1980. 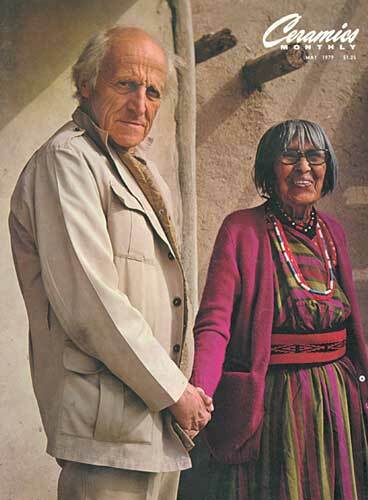 Michael Cardew and Maria Martinez on the cover of Ceramics Monthly, May 1979.